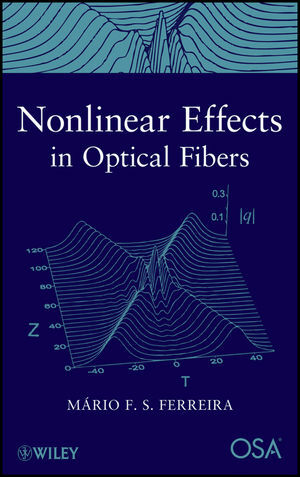 This book will provide insight into the principles and applications of nonlinear effects in fibers for students, researchers, and developers who have a basic understanding of electromagnetic theory under their belts. It will explore the physics, limitations, applications, and research results surrounding nonlinear effects in fiber optics. In addition to communications, optical fibers are already used in medical procedures, automobiles, and aircraft and are expected to have many other applications. This will expand the range of industry workers who will find a book of this type useful. Mário F. S. Ferreira, PhD, is the leader of the Optics and Optoelectronics Group of the I3N, the Institute of Nanostructures, Nanomodelling and Nanofabrication, a national Associate Laboratory. He has written for more than 300 scientific journal and conference publications and has served as an advisor for many scientific journals and publishers. Dr. Ferreira is a well-respected leader and lecturer for the Optical Society of America and SPIE, along with the New York Academy of Sciences, the American Association for the Advancement of Science, the European Optical Society, the European Physical Society, and the Portuguese Physical Society. 2.1 Wave Equation for Linear Media. 2.3 Energy Density and Flow. 2.4 Phase Velocity and Group Velocity. 2.5 Reflection and Transmission of Waves. 2.6 The Harmonic Oscillator Model. 2.8 The Limit of Geometrical Optics. 3.2 Wave Propagation in Fibers. 3.4 Modulation and Transfer of Information. 3.5 Chromatic Dispersion in Single-Mode Fibers. 4 The Nonlinear Schrödinger Equation. 4.2 The Nonlinear Refractive Index. 4.3 Importance of Nonlinear Effects in Fibers. 4.4 Derivation of the Nonlinear Schrödinger Equation. 4.6 Numerical Solution of the NLSE. 6.4 Impact and Control of FWM. 6.7 Nonlinear Phase Conjugation with FWM. 6.8 Squeezing and Photo-Pair Sources. 7.4 Control of Intrachannels Nonlinear Effects. 9 Other Applications of Optical Solitons. 10.1 Coupled Nonlinear Schrödinger Equations. 10.3 Solitons in Fibers with Constant Birefringence. 10.4 Solitons in Fibers with Randomly Varying Birefringence. 10.5 PMD-Induced Soliton Pulse Broadening. 10.6 Dispersion-Managed Solitons and PMD. 11.1 Raman Scattering in the Harmonic Oscillator Model. 11.4 Impact of Raman Scattering on Communication Systems. 12.1 Light Scattering at Acoustic Waves. 12.2 The Coupled Equations for Stimulated Brillouin Scattering. 12.3 Brillouin Gain and Bandwidth. 12.4 Threshold of Stimulated Brillouin Scattering. 12.5 SBS in Active Fibers. 12.6 Impact of SBS on Communication Systems. 13 Highly Nonlinear and Microstructured Fibers. 13.1 The Nonlinear Parameter in Silica Fibers. 14.1 Nonlinear Sources for WDM Systems. 14.3 Optical Pulse Train Generation.